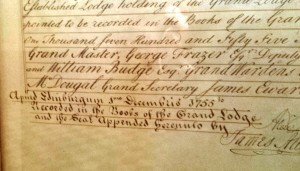 Endorsement block of the original 1755 charter of Kilwinning Port Royal Crosse from the Grand Lodge of Scotland. In 1755, the Grand Lodge of Scotland issued a charter to Kilwinning Port Royal Crosse Lodge under the second charter issues to lodges in the colony of Virginia and the lodge was therefore known as “Kilwinning Port Royal Crosse Lodge No. 2”. Throughout the lodge’s early years, it retained this number until the lodge went dormant in 1849 due to inactivity. A group of brothers from the original lodge applied for re-chartering in 1855; however, in that same year another lodge was granted a charter from the Grand Lodge of Virginia and given the dormant “No. 2”. The Grand Lodge issued a new charter to Port Royal Kilwinning Crosse (note the reassignment of “Kilwinning Crosse” to the end of the name) in 1855 and allowed both the newly formed Atlantic Lodge No. 2 and Port Royal Kilwinning Crosse Lodge No. 2 to share common number. Unfortunately, Port Royal Kilwinning Crosse would again go dark until re-chartered in a nearby town elsewhere in Caroline County. 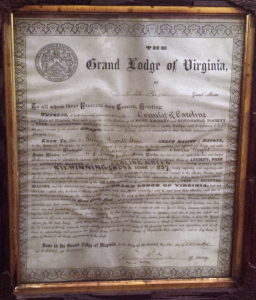 Current 1881 Charter from the Grand Lodge of Virginia under whose authority the current Kilwinning Crosse Lodge meets. 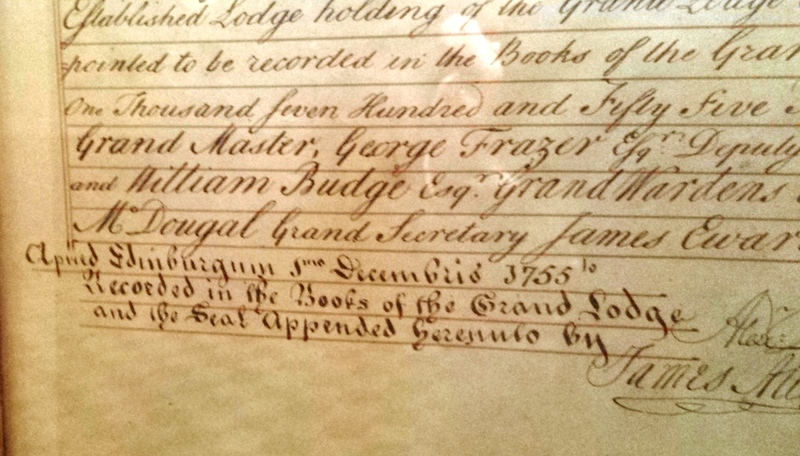 By 1881, the Grand Lodge had decided to no longer allow lodges to share numbers. 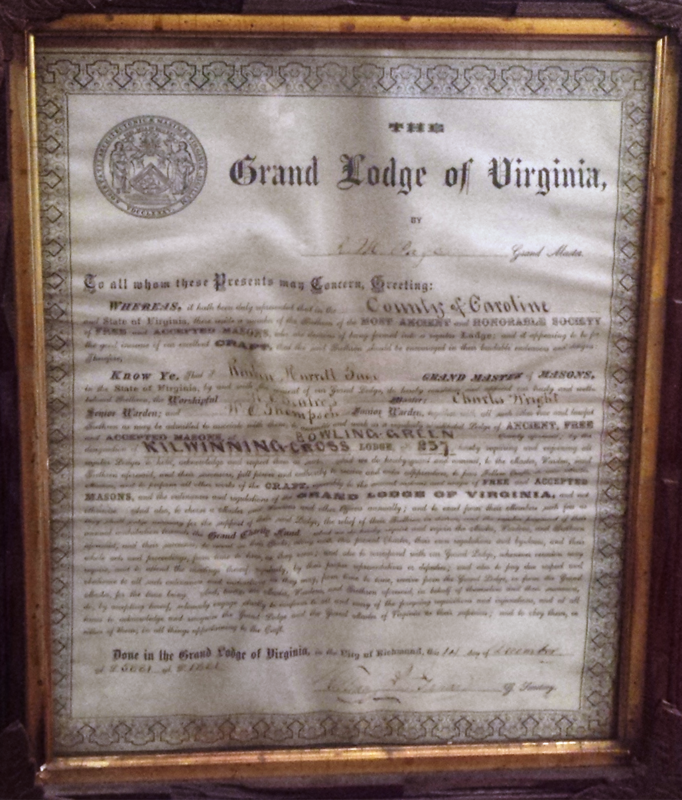 For this reason, the reformed Kilwinning Crosse in Bowling Green, VA was granted a charter under Lodge No. 237. It should be noted that the brethren who formed Lodge No. 237 had direct membership lineage from the original Lodge No. 2 and still maintained many of the original lodge furnishings of the old No. 2. Kilwinning Crosse operated under this number until 1902 when the Grand Master of Masons in Virginia recognized the lineage of Kilwinning Crosse and approved her by-laws renumbering the lodge to “2-237”. To date, Kilwinning Crosse is the only lodge in the commonwealth of Virginia with a recognized hyphenated number. With this number, though seemingly such a small part of the lodge’s identity to an outsider, the brethren are reminded of the rich history and heritage that it holds, persevering through revolutions, wars, natural disasters, and civil strife.